I just had to add this digital snap I took tonight. The Moon and Venus were putting on a show tonight and the sky was perfectly clear. I had been waiting for this event all month and Mother Nature was kind enough to cooperate with the weather. It had been briefly snow hailing this morning and was blustery and cold but by the evening the skies had parted and the solar system smiled on us. I couldn't help but stare at the remarkable site in the sky tonight. I broke open a bottle of 2008 Alaskan Smoked Porter and took in the view. Wow. 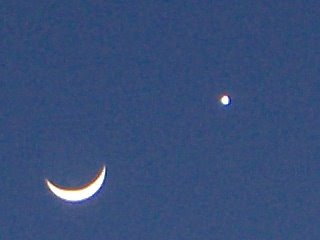 Anywhere you went tonight in Greeley Colorado you could see the big Moon and Venus lighting up the western sky. It was almost like poetry. Glad I had a chance to witness it. Venus has been a constant western sky companion for quite a while now. It was just a month or so ago when Jupiter was also in the evening sky. But this was so bright and so clear it was spectacular. Just wish I would have had a better camera to take a picture with. So here is a big CHEERS to our universe tonight. The moon and planets and a good beer made for a great evening! Did anyone else see this site tonight? Did you take a picture of it? Let me know. I'd love to see some other pictures of this pairing. 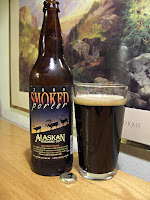 - Alaskan Smoked Porter review.